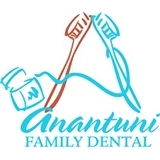 Anantuni Family Dental (Chandler) - Book Appointment Online! Welcome to the Chandler dental office of Dr. Sandhya Anantuni voted Best of Chandler . We are delighted to have you visit us. Complete Patient Satisfaction is our Goal! We are accepting new patients and immediate appointments are available. Our patients come from all over Phoenix Metro including Chandler, Tempe, Ahwatuke, Mesa and Gilbert. Total Patient Satisfaction is guaranteed because we offer high-tech dentistry with friendly and capable staff. Your comfort during dental treatment is a high priority with us. Knowing how busy your life is living in Arizona, we value your time and provide prompt and convenient office hours (Early morning, late evening and Saturday appointments). We use the latest techniques in dental care to achieve our goal of Total Patient Satisfaction. Superb communication by the front desk staff!! Clean, friendly and welcoming.